Flak flying service tunic (Fliegerbluse). Felted wool short tunic (Fliegerbluse), for a corporal (Gefreiter) of the Luftwaffe Anti-aircraft Artillery (Flak), as showed by the red color of the collar patches (waffenfarbe) and by the piping of the shoulder-straps. With the German acronym Flak (flugabwehrkanone) were indicated the cannons for the anti-aircraft defence. By extension was used to indicate all this branch of the German army in WW2. Externally, as well as inside, the tunic has a beautiful and glamorous patina due to use. Lined with the typical light blue colour satin, the tunic is not shortened or modified. Complete in all its parts, is properly marked in the inside left part. Medium size. More than good the conditions. 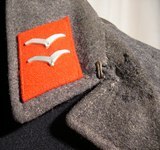 Notify me of updates to Flak flying service tunic (Fliegerbluse).